If you’re looking for authentic Korean food in Dubai, you can’t look past Hyu in JLT. Owned by husband-and-wife duo Annie Chung and Woo Young Kim, this little gem of a restaurant built up a loyal following when it opened in Oud Metha in 2010. It’s a sign of just how good it is that since the restaurant relocated in June, many of those regular customers have followed them all the way to the other side of town. Hyu’s friendly owners are only too happy to guide newcomers through the menu, and offer their recommendations. 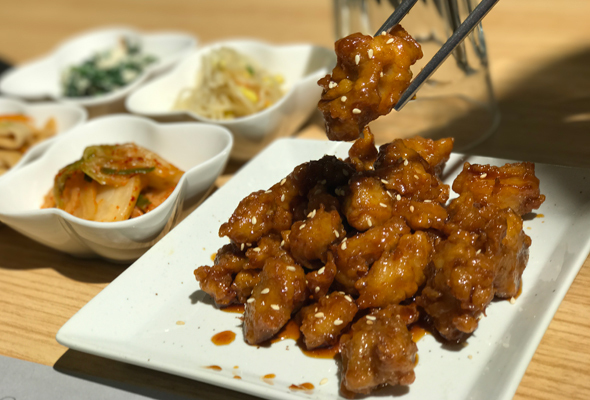 If you’re unfamiliar with Korean cuisine, start with the Dakgangjeong (Dhs50), or crispy popcorn chicken covered in sweet and spicy sauce. Once you’ve tasted this addictive Korean fried chicken, you’ll never be able to look at KFC in the same way again. 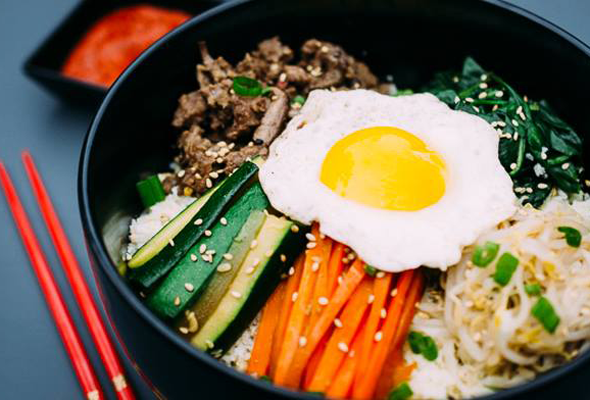 Another must-try dish is the Bibimbab (Dhs55), or mixed rice with meat and vegetables. This is the ultimate in Korean comfort food, served with a big runny egg on top that is whisked through to create a sauce. Hyu’s version is one of the best we’ve tasted outside of Seoul, served in a hot stone bowl that allows the rice at the bottom to become beautifully crispy. In true Korean style, every table is fitted with a grill for do-it-yourself barbecue. 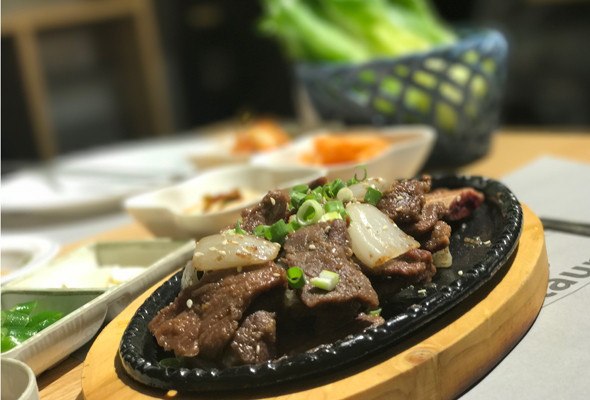 Order the Yangnyumgalbi (Dhs90), or marinated beef short rib, and inhale the delicious smoky fragrance as it sizzles away in front of you. To eat, wrap the meat in a lettuce leaf, with a dab of spicy sauce and some garlic. Hyu is also the perfect place to get your kimchi fix – the restaurant pumps out about 50kg of the stuff a week from its little JLT kitchen. The spicy fermented cabbage, a staple of Korean cuisine, is served as a complimentary side dish with your meal, but here’s an insider tip: The restaurant also sells it to customers to take home. Hyu, Cluster O, JLT, daily 11am to 3.30pm, 6pm to 10.30pm. Tel: (050) 871 7389/050 227 3004. More info on Facebook. 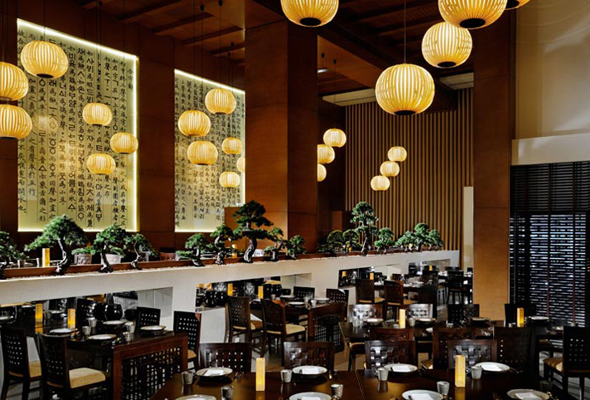 Located inside the flash Asiana Hotel, Sonamu serves up all the Korean classics in an elegant setting. If you’re new to Korean food, start with the grill (don’t be put off by the rather literal ‘one whole cow’ listed on the menu), which can be cooked at the table. Or head along for their BBQ nights every Tuesday and Saturday, where you can enjoy all-you-can-eat-and-drink (Dhs189 for soft drinks package, Dhs259 for alcohol package). Sonamu, Asiana Hotel, Deira, daily 6.30am to 10am, noon to 3pm, 6pm to 11pm. Tel: (04) 238 7777. More info on website. Kimchikin is a fast food chain with a very obvious focus on Korean-style fried chicken (and trust us, it is delicious). There’s also some soups and rice-based dishes on the menu, as well as its own version of the street food favourite, topoki (rice cake and fish cake with sweet chili sauce). The restaurant has a colourful Korean touch, with K-pop music videos and sticky notes with messages adorning the walls. It’s cute, it’s quick, it’s cheap and it’s tasty. 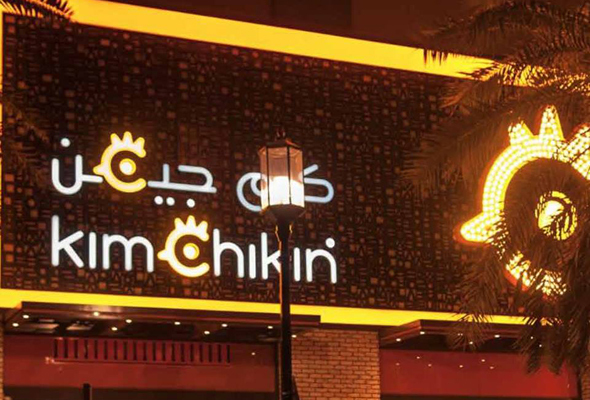 Kimchikin, ground floor, Al Ghurair Centre, Deira, Sun to Thurs 11am to midnight, Fri and Sat 11am to 1am. Tel: (04) 348 3311. More info on website. Traditionally, desserts aren’t a huge part of a Korean meal. Instead, sweet treats are eaten with tea. At Sarang Bakery, you can sample Korean cakes and breads with unique fillings like red bean and green tea. There are also some tasty savoury options (be sure to try the sausage bread). 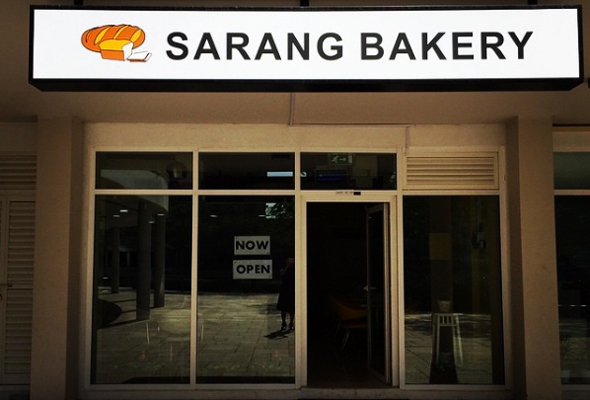 Sarang Bakery, Cluster C, Gold Crest Executive Tower, JLT, 10am to 8pm, closed Fridays. Tel: (04) 453 5477. More info on Facebook. Sobahn means ‘good’ in Korean, and the restaurant certainly offers a good mix of Korean and Japanese favourites. You can get your grill on, with all-you-can-eat meat from Dhs139 on Thursday nights. There’s also outdoor seating, where you can enjoy views of the Dubai skyline. Sobahn, Matloob Building, Sheikh Zayed Road, noon to 3pm, 6pm to 10.30pm. Tel: (04) 380 7888. More info on website. 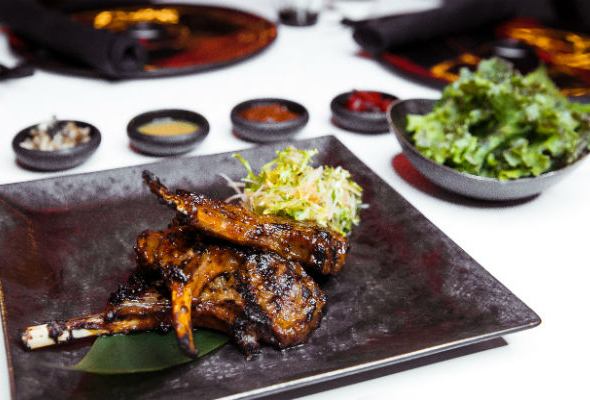 This fine-dining restaurant in the W Dubai Al Habtoor City also serves a fusion of Japanese and Korean cuisine, but it’s the latter whose flavours dominate the menu. Check out their Seoul Food Sundays, where you can enjoy unlimited platters of Korean favourites from Dhs245. Namu, W Hotel, Al Habtoor City, Business Bay, daily noon to 3pm, 6pm to midnight. Tel: (04) 436 6677. More info on website. Again, don’t let yourself be overwhelmed by the extensive menu (there are actually three menus; Korean, Japanese and Thai). No matter what your favourite Korean dish is, you’ll probably find it here, with traditional soups, hotpots, and noodles as well as the BBQ offerings. Try the saucy jajangmyun noodles – loud slurping is compulsory. 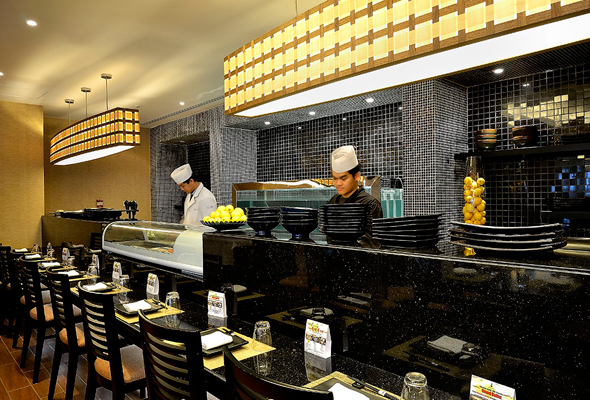 Shogun, Office Park Building, Dubai Media City, daily noon to 3pm, 6pm to 11pm. Tel: (04) 448 9290. More info on Facebook. Kung’s is the only authentic Korean karaoke where you can order mandu (Korean dumplings) to the room. 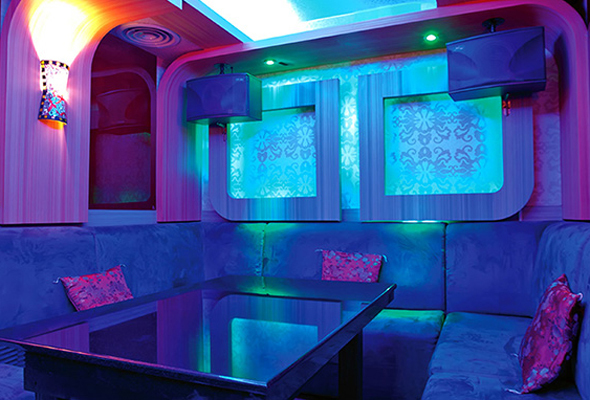 Its karaoke booths are fully kitted out with mics and TVs, and the karaoke system even rates your performance – so you can truly feel like a K-Pop star. Kung Korean Restaurant & Karaoke, Byblos Hotel, Barsha Heights, daily 9am to 2am, Dhs110 per hour. Tel: (04) 488 000. More info on website.